In between my job, and attempting to train for triathlon, and going to the cinema, and reading stuff, I occasionally try to get out and experience some of the other things that London has to offer. I am, honestly, not very good at doing this. Sometimes it’s difficult to get a group of friends to go with, and I’m somewhat shy. Sometimes I just don’t have the energy or time. But sometimes, something crops up that piques my interest so much that there’s no way I can turn it down. I’ve mentioned before that I love to dress up and faff about with stage make-up. I found our make-up artist’s work on my team’s effort for last year’s 48-Hour Sci-Fi Film Challenge fascinating, and I love Halloween as an excuse to pull out the paint. 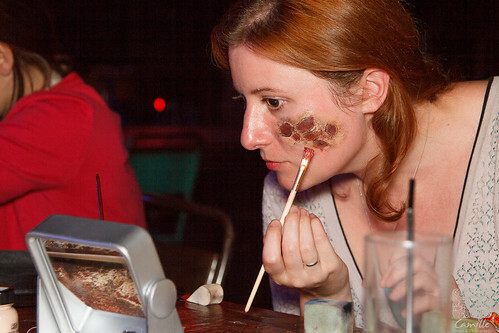 So when a friend of mine told me that his new events company was hosting a gory make-up class at the fantastic Doodle Bar, I jumped at the opportunity to go. The Doodle Bar itself is worth a mention here, being the unique space that it is. Hidden away on the edge of the river, by the North West corner of Battersea Park, it’s somewhat difficult to find, but absolutely worth the effort – a warehouse space that manages to be welcoming, and is handily shared with a local gin distillery. Check out its website. So, the make-up class. This was part of the Jaded Make-up series. Gecko Superstar invited self-taught make-up artist Jade Bruce along to show a bunch of complete amateurs how to create a few different effects, including burns, broken-glass cuts and the ever-useful black eye. Also present was writer Danielle Goldstein from Time Out – you can see what she thought of the evening here. First off, I have to say the class was really welcoming – if you want to try something like this, but can’t (as I couldn’t) convince your friends to go (mine are all holding out for a ‘pretty’ make up class! ), this is the place to do it. I was essentially there on my own, and I arrived earlier than intended. As Jade arrived and set up for the class, she chatted away with me. Very personable, very patient (as we found out during the class) and very enthusiastic about her craft, it was a real pleasure to talk to someone who also enjoys messing around with gory face paint. Especially nice to talk to someone who knows what she’s doing with it. As people arrived, so did the pizza – included in the price of the £13 ticket. We ate and chatted and got to know each other a bit. With around ten people present, it’s just the right number of bodies to be busy but not intimidating, and to allow Jade to focus on everyone’s efforts without rush. Part 2 – broken-glass cuts. Jade hands out blobs of wax, and we each choose a place to cut ourselves. Roll the wax into a sausage, place it on the skin, and then use hand-lotion wetted fingers (for the prevention of sticking wax) to smooth it into place. Then cut into the wax. This was weirdly hypnotic and gross to do – and to watch other people doing – and we hadn’t even added the colour yet. Dark, dark red lines the bottom of the cut to make it look as deep as possible, and flesh-coloured foundation to blend the wax in with skin. Then plenty of fake blood used to attach the finishing touches – the ‘glass’, made from broken CD cases. It is disgustingly effective. The staff at the bar are fascinated, as are the couple who are nearby playing on the ping pong table and trying to discreetly see what’s going on. Part 3 – last, but not least, as the light fades in the big room, it’s time to work on the burns. I decide to do a big one on my face. Swirl on the liquid latex, let it dry, and then pick at it. If you’ve ever burnt badly enough to peel, you’ll know how satisfying it to, well, peel the peeling – and this is no different. Excuse me while I powder my nose. I mean my burn. Once the patch of latex-skin is suitably mangled, it’s time to fill in the gaps. In the holes, the background is pink and bloody red. The rough edges of the holes are daubed with red and black paint to create a singed look around the edges. The result is a glistening, horrible mess. It is fairly realistic for a first effort. I’m very proud of my mutilated face. Once everyone’s finished, we all head outside to the Doodle Bar’s resident burnt-out car and arrange ourselves around it in a display of bad-taste fake car accidents, while Camille Shah, who is documenting the evening for Gecko Superstar, takes a series of pictures. We’ve been playing with make-up for a couple of hours at this point. Jade hands out make-up remover for the people who want to take their make-up off before leaving the bar. Not that many people do. Several are moving on to another pub, and keep their make-up in place to show friends – in the course of the lesson, quite a few texts and photos have been sent to unsuspecting mates detailing fictional bar fights. I don’t move on to the next pub, but I leave my make-up on all the same. I’m curious to see the reactions of people on the bus home. The final count was three double takes, several surreptitious glances, and a girl who looks at my face and my glassy arm (which I’m prodding, because I find it fascinating), goes pale and moves seats. No one asks if I’m ok, though – probably because despite all the blood, I’m grinning like an idiot, because I had a really good evening. 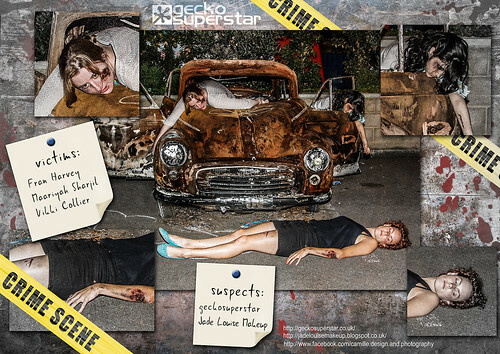 Gecko Superstar and Jaded Make-up will be doing more events in the future. A Pop Art (Liechtenstein) night has just finished, and more different styles will be coming up. You can follow them both on Twitter (@geckosuperstar and @JadeLouise_MUA) or find them on Facebook.